If you weren't a wise Fassinator, you'd think a certain prominent news story about Michael Fassbender was more important than him earning his first friggin' Academy Award nomination. And to add to that, his long awaited comedy film Frank is opening at the Sundance Film Festival on Friday, and a trailer clip was released on Thursday (see link). Why isn't the media going crazy over these two headliners? Oh yeah, it's not personal and juicy. I get it. To me, those two article types were the meaningful events regarding Michael that fans should really care about. As this intense week comes to a close, it's wonderful knowing that all of Hollywood knows Michael Fassbender and how talented he is. And it's been fun reading supportive comments about him on the Internet from people who are very familiar with his work, and stating that he should be on his second or third nomination already. 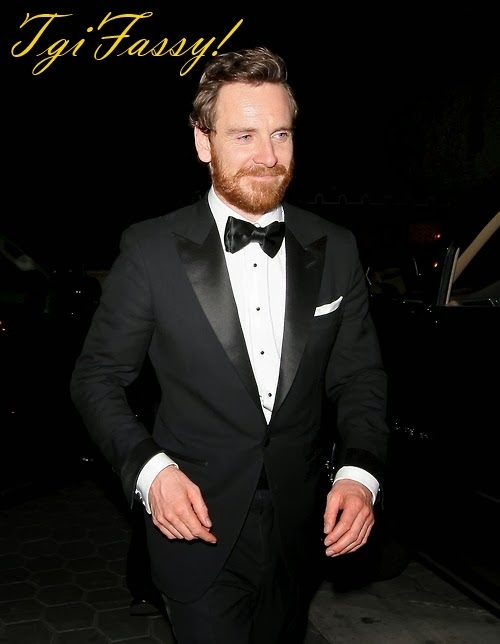 I was going to unveil something exclusive to the Fassinating Fassbender community in support of Michael today, but it will be delayed just a tad until we can reconfigure something. UPDATED: Hupsakeek and I created a For Your Consideration Ad page for Michael. Please check it out here. But to give you an idea, it's just a cool artistic expression from FF to help support Michael in his campaign to win the Oscar. Now as I stated yesterday, the Best Supporting Oscar category is tight. There are some who have their favorites and are convinced that certain a person or persons have it in the bag, and that Michael should just be content with a nomination. One confused girl wrote that Michael's performance in 12 Years a Slave was "mediocre". His performance may be a lot of things, but mediocre is not one of them. And it's always so funny to see such harsh criticism coming from common folk who can't act their way out of a paper bag, let alone direct a cat towards it's kitty litter. So they need to chill and shut the hell up. LOL! In all the years that I have been paying attention to the Oscars, I've never liked the concept of a front runner because it automatically excludes the other four nominees from having any real hope to win. Their names are always relegated as an afterthought once the "front runner's" name is mentioned as the inevitable winner. Hell, if someone is so damn great, why bother nominating four other people? Like in the years that Daniel Day-Lewis is in the running, he's always the front runner and it's so damn boring. Mind, he is a brilliant actor, just wonderful, but Christ on a cracker, with all things considered equal, can one really say that playing President Lincoln, was more challenging or more interesting than playing a cocaine addicted airline pilot? They are two totally different roles and should be judged differently. But as it has always been in the 86 years of the Oscars, five performances are selected as nominees, and each performance receives a number of votes. So when the voters look at the ballot for the supporting actor, they are going to see five different and unique characters: a pirate, a hustler, a slave-owner, a wall-street creep, and a transgender woman. Add into the mix that not all voters will have seen all five performances (they are suppose to, but they don't), and that they will just vote for what appears to be the popular choice based on precursor awards, mainstream media reporting them as the chosen one, and 11th hour brilliant marketing, and voila!, you have a "winner". Each actor brings something unique into their character, and each character demands something unique from each actor. In all fairness, the subjective nature of selecting a winner really comes down to the individual's taste and how they are INFLUENCED into selecting the winner. So when a performance is spoon fed to the populace as THE performance, especially if said performance is in a movie that is not divisive, accolades can be served on a silver platter because it causes less offense, and it's likable, and just easier to vote for without straining the brain and hand wringing. So keep this in mind in the coming five weeks before Oscar night because this year is to going to be the most contentious in recent memory. A lot of people don't want to see 12 Years a Slave and it's cast/director do well, and there's already snarky talk about it not receiving as many nominations as predicted. Now is the time to just celebrate Michael and the film's Oscar nomination successes, and support the film as it gets into position to make history. The Screen Actors Guild Awards are Sunday night and Michael is up for Supporting actor and Best Ensemble. A lot of people believe that this is the opportunity for 12YAS to demonstrate its viability by winning the Ensemble award which is equivalent to Best Picture. I'm going to see The Wolf of Wall Street this weekend, I have no interest in American History, it just looks silly and unoriginal. I wish the team of "12 years of slave" the award for best ensemble and of course the "Supporting actor" to Michael for the SAG.And I keep my fingers (and toes) crossed for the Academy Award and BAFTA (not easy to walk). Hey Stephanie, do you live in or near Paris? I don't know when I'll be able to see it, but Frank is a quirky light comedy that will allow Michael to show off his talents in a new way. Just checked IMDB and according to that Frank will hit the screens September 2014 in The Netherlands...so that means patience. And the press overhere talk only about the nominations for The Wolf of Wall Street and American Hustler.Strange because TYAS has a tiny Dutch connection...Steve is living in Amsterdam. TYAS and American Hustlere aren't on screen yet, and Wolf of Wall Street is on screen since yesterday. So that isn't the reason. It got all to do with the actors. The cast/director isn't well know here so the focus is on the actors who are "famous" here.